Practising addition without any worksheets! 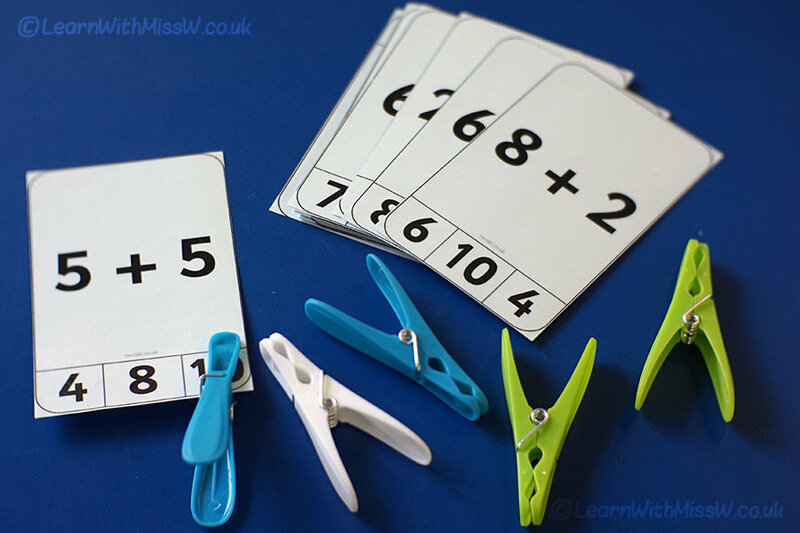 This is one of the warm up games that we start each maths lesson with. It is for children who are fairly comfortable with the addition process and have strategies they can already use. The students have access to numberlines and cubes for counting to help them figure out the answer. This activity can be found at www.twinkl.co.uk/resource/t-n-2356-addition-to-10-peg-activity. It is in black and white, which is handy as it saves on coloured ink. It’s hard to tell from the photo, but I’ve actually printed these on light blue to make them look more attractive and to help prevent my maths games from getting muddled with each other. You can also tick the correct answer on the back to make this a self-correcting resource.